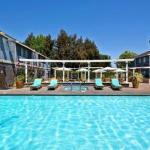 Free hot breakfast Wi-Fi access a seasonal outdoor pool and a central location make the non-smoking Maple Tree Inn one of the most popular hotels in Sunnyvale among our guests. The three-floor Maple Tree Inn has 177 rooms all with coffee/tea makers mini-fridges microwaves high-speed internet access and premium cable TV. The Inn's drool-worthy buffet breakfast includes a rotating menu of eggs sausage pancakes waffles pastries muffins bagels toast yogurt seasonal fruit coffee and juice. Additional Japanese breakfast items such as miso soup rice instant noodles and more are also available. Come back in the evening (Monday through Friday) for the reception with free beverages and light hors d'oeuvres. Then treat yourself to a soothing soak in the hot tub. The hotel also has an outdoor pool a fitness center a laundry facility and a lending library. The Maple Tree Inn is in the center of Sunnyvale less than a mile from the Sunnyvale Arboretum and Sunnyvale Heritage Park Museum. The Sunnyvale Caltrain stop is two miles away giving guests easy access to San Jose and San Francisco. California's Great America amusement park is six miles northeast and Winchester Mystery House is six miles southeast. If you're driving from San Jose International Airport the hotel is seven miles west.